So here is the finished coat at last. These were taken very quickly, shortly before heading into town on what is apparently the busiest shopping day of the year in the UK. Full disclosure: I’ve edited out the signpost that was making an unwelcome appearance in all the front views. The goofy pose owes nothing to photo editing software however. Here’s the original. I don’t know about you but I always like to see the pattern photo next to the finished item. Sometimes the pattern photo and the finished product are very different, but in this case I think mine’s come out pretty close to Burda’s. Fabric choice helps! The magnetic snaps turned out not to be strong enough for the bottom two snaps, so I replaced them all with regular snaps. I did try to cover the snaps in lining but I think I must have the wrong sort of snaps, or possibly the wrong sort of lining. As soon as I closed the covered snap it tore a hole in the covering on the female half, so my snaps ended up being au naturel. I’m very pleased with the fit in the end. Thanks so much everyone who gave fitting advice! The bust and waist seams are now horizontal and all those annoying wrinkles on the princess seams are completely gone. I really like the design of the back of this coat with all the seamlines. Glad I didn’t have to finish all those seams though. My fabric’s non-ravelly and the coat is lined so I left them alone. The sleeves set in fine. The lining sleeves were a bit more of a struggle but removing most of the sleevecap ease made it easier than it normally is. And there isn’t any excess fabric across the back of the coat but I can still move my arms! The shoulder pads still feel a bit weird but I guess I’ll get used to them. These are the smallest ones I could find. So how does it wear after a day out shopping? The neckline is very high, which is going to be great on cold days. The patch pockets are not the most practical pockets. You can’t shove your hands into them. In fact you can’t store a great deal in them at all. This is probably a good thing because my coat pockets normally contain a highly sordid collection of old hankies, bus tickets, and receipts. I think patch pockets might work out in the same way changing to a smaller handbag did: I carry much less rubbish around with me these days. This is definitely a smart coat. I don’t think I could have it as the only coat in my wardrobe because of the pale colour and lack of storage space. But I’m glad I’ve got it an option! 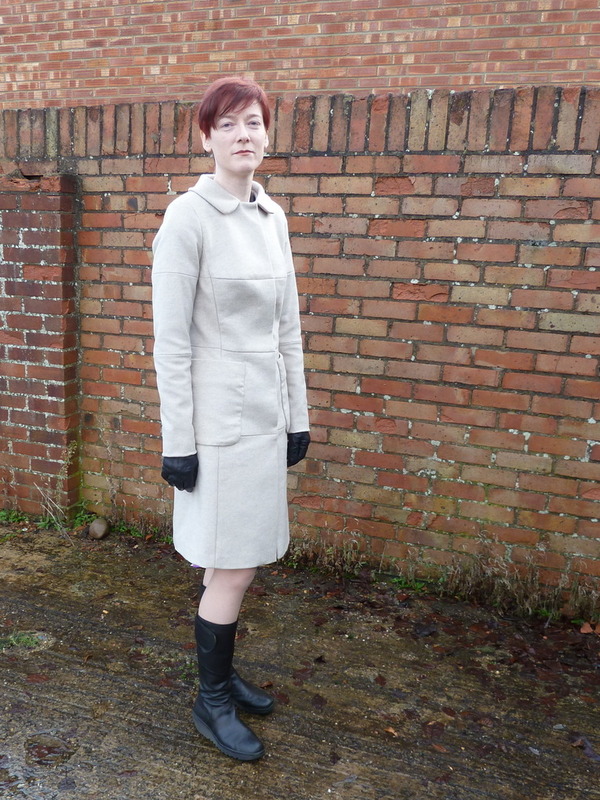 Posted on December 16, 2012 January 14, 2017 by catherinedaze	This entry was posted in burda, Burda 104-12-2011 coat, dressmaking, Finished, sewing and tagged burda, coat, dressmaking, sewing. Bookmark the permalink. Very very nice Catherine. I really like those seams throughout the structure of the coat – makes it very different. Great fit too. How pleased are you?! You have excelled yourself, Catherine (again). What a terribly chic and stylish coat! So you! I love it. Lovely. Definitely worth all that hard work with the muslin! Oh my, this is the perfect ‘winter white’ coat! So elegant and smart, I really would love such a chic coat in my closet! You have got it spot on Catherine, the fit’s amazing!!! Just gorgeous. The seam line details, the fabric choice and the fit! And I enjoyed reading the progress posts re how you arrived at this great looking coat! So very cool. I’m so glad you walked us thru this- its wonderful. WOW Catherine–it looks great!! All those drag lines are gone–a perfectly fitting coat! Beautiful, beautiful coat! All your fitting work was so worth it. It’s beautiful Catherine, very well done! Such beautiful seaming and the fit is perfection! A beautiful coat! Look at that FABULOUS FIT! fantastic, so happy for you. Looks lovely, so chic. The horizontal seams are perfect, as they must be on this design. hurrah for you, I love it. and slighly envious, although I would never make myself a light color coat like that. (fear of spots) looking forward to your next creation. This looks fantastic! The fit is absolutely flattering and I really love the patch pockets! The seamlines make a really polished finish. Well done! I do love a good finished garment post and agreed – it’s always nice to see the completed version next to the original inspiration! I’m always curious to see the back of a jacket/blazer/coat – it’s the hardest to fit when you’re sewing alone – I think you’ve done a fabulous job. It photographs beautifully, which can only mean it’s even nicer in real life (at least, that’s how my photos always seem to turn out). Bummer about the snaps though – live and learn! It’s a wonderful coat! Light coloured coats may be very impractical, but they look oh, so smart! Lovely! You did a great job on the fit and the finishing. Great job Catherine. Winter coats that genuinely flatter are hard to come by. Wow, that is a beautiful coat. You look so stylish, and it is fitted so precisely. Oh wow Catherine, you’ve done a brilliant job, the fit looks brill. Great job on all the fancy finishing too. Simply wonderful. I love this pattern, and your version makes me love it even more. hahaha awesome-you conquered it! Also, if you ever want a different colour you can dye it! Great coat! as you say, it really looks like the Burda’s magazine! the fitting is GREAT! You did a fabulous job! I’ve been wanting a white winter coat for years & yours is good inspiration. I’m glad you persevered with getting the fit right- it really paid off. Gorgeous, a great colour and your fit is amazing, I am glad you stuck with it and sorted it all out. The extra seam lines make it so interesting and I think quite classic. It really turned out fantastic! It has such a great fit! I was wondering how much ease is there for wearing knitted cardigans or bulkier clothing? Yes it is just lovely – congratulation on surviving the blood loss and burns along with everything else. The colour is perfect as is the fit. Lovely.